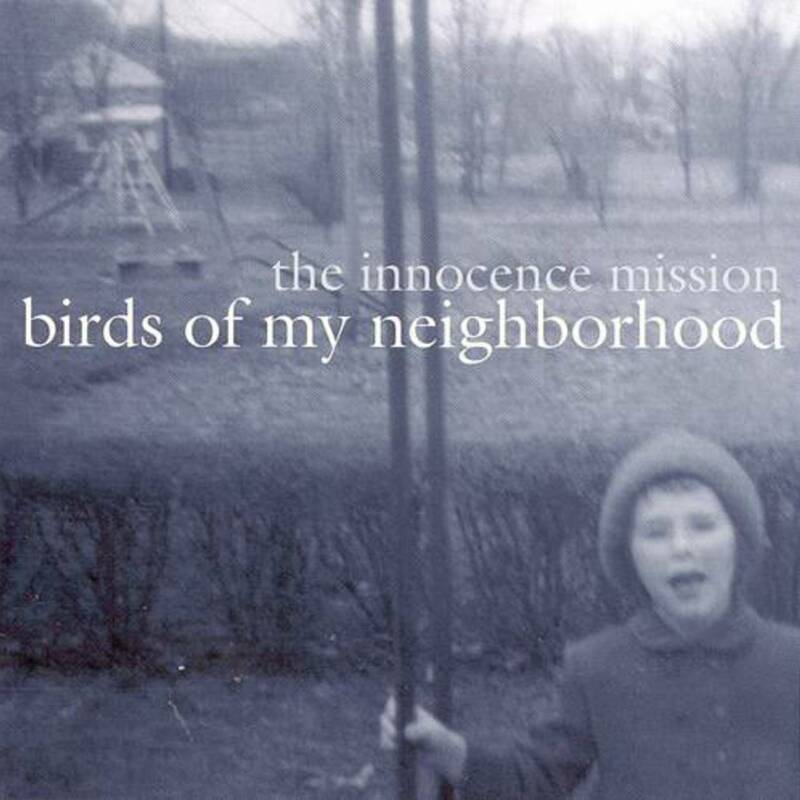 The new re-mastered version of The Innocence Mission’s Birds of My Neighborhood lets this masterful recording expand to fill a room, resonating in hardwood floors, giving the listener the freedom to move about in the spaces between Don Peris’s exquisite guitar stylings and the fragile beauty of Karen Peris’s vocals. It’s the next best thing to having them visit you personally in your living room and play you a song… a dream I haven’t given up on yet. I know, it sounds funny to dream of having one of your favorite bands visit your home, but hey… if music as glorious as The Innocence Mission’s can exist and find audiences amid the clamor and buzz, then I’m inclined to believe in miracles. These songs are as fresh and beautiful as the day they were recorded, more than five years ago. While Don and Karen have moved on from those days of deep darkness in which they crafted such palpable sounds of sadness and hope, their work continues to give voice to the wounds and wishes of people everywhere today. And rather than merely wallowing in angst, these songs are journeys that move us from a place of grief to a place of gratitude and grace. This review was originally published at The Phantom Tollbooth in September 1999. Imagine a girl and a boy sneaking into an empty cathedral, carrying guitars. They sit down beside some candles. The boy begins to play; the girl to sing in sweet ethereal tones the poetry of their personal praise to their Savior, the stories of their lives, the accounting of their trials…but all of this is done quietly, so as not to draw a crowd. That’s the kind of thing you’ll hear when you listen to the music of The Innocence Mission. Intimate, resonant… a timid sound in an enormous space. Don Peris’s instrumentation sounds sometimes more like the bells of a country church than an electric guitar. His interaction with his wife, vocalist and lyricist Karen Peris, speaks of a deep understanding of each others’ artistic strengths, and the same goes for their longtime bassist Mike Bitts, who gives the songs backbone. While Steve Brown’s percussion was well-suited to previous outings, his absence here does not hurt these quieter pieces. When Karen Peris sings, the words may come straight from her diary, her most revealing meditations on the things she cares most about. But anyone can relate to the feelings and questions there, and find comfort in the answers that she herself finds sustaining and restoring. She’s not preaching; in fact she may not even be aware of the audience at all. And her contemplations are so deeply rooted in life’s most meaningful things–faith, love, humility, family, compassion–that no matter how unfamiliar the characters in the song or how cryptic the circumstances that inspired it, the imagery is intense and powerful, like what might have happened if Denise Levertov had written a song with Simon and Garfunkel. Without sacrificing any of these qualities, the band turns over a new leaf with Birds of My Neighborhood. After their explorative debut album, which found them aspiring to be a radio-ready pop band a la 10,000 Maniacs, the Mission hit their stride with Umbrella, settling on a fusion of pop and folk that has only occasionally bent the ear of mainstream radio (with hits like “Bright as Yellow”). That sound has become their signature–crystalline, meditative–a simple combination of guitar, vocals, and percussion that owes something to Simon and Garfunkel’s Sounds of Silence and Neil Young’s Harvest. Umbrella focused on childhood memories and a growing understanding of faith. Glow was more ambitious, excerpts from a family history, with similar instrumental restraint that allowed some tracks like “Everything’s Different Now” to soar to new heights of energy and enthusiasm. Now, with Birds of My Neighborhood, there’s a different thread…loss. It’s like we’ve turned a page in the photo album to the darker side of life–breakups, despair, the loss of friends and the realizations that the good old days are over. In “July,” perhaps Karen Peris’s most sublime lyrics of all, she tells us of a season of drought where “we both wake up so dry/that no more tears can leave us.” Such intense hardship is a new country for the Innocence Mission, but even at midnight the day begins. could see the greatest light. With repeated listenings, you will find these songs stay with you, and in spite of their acknowledgment of life’s darker side—indeed, because of that inclusion—they can be a source of strength, turning our attention to the future and to the benevolence of the Divine. I’ve taken to playing Birds on my headphones on the bus ride home from work; it reminds me that, when things seem heavy and burdensome, I have much to cherish, anticipate, and enjoy. Often dismissed as merely sentimental and naively optimistic, The Innocence Mission remain a needle in a haystack, a mother lode of musical gold in the mountain range of modern pop music. While so many bands dwell on cynicism, on shallow love songs, on diatribes and proselytizing, Karen and Don Peris and Mike Bitts have crafted four albums of praise songs, meditations, reminiscences, poems, and stories that have the evocative power of an old photo album. They offer themselves through music as good friends, trusting the attentive listener enough to confide in them. Five words or less: Deep comfort and delicate grace.